Potentially destructive high-energy electrons streak into Earth's atmosphere from space, not as Shakespeare's "gentle rain from heaven," but at velocities approaching the speed of light. This particle onslaught can lead to ozone depletion and damage to the orbital satellites that provide us with the navigation, communication, weather, and military-recognizance information upon which we have become increasingly dependent. These satellites fly through the Van Allen radiation belts—giant concentric layers of charged particles held in place by the Earth's magnetic field. An increase in particle density and charge brought about by solar activity can raise the level of threat to our critical satellites. Dartmouth physicist Robyn Millan and a team of scientists have engaged in a unique study of this electronic bombardment, for the first time employing two distinctly different and distant vantage points high above the Earth. "This is exciting for us because we are integrating data collected by our instruments with the data from NASA's Van Allen Probes," says Millan, an associate professor of physics and astronomy. "These are the most direct measurements that have ever been made that link what's going on at the equator to what's coming into the atmosphere in the southern polar region. We are measuring particles that are getting scattered into Earth's atmosphere at the same time as the spacecraft are measuring what's going on in space." Millan uses instruments carried aloft by balloons launched from Antarctica, rising as high as 125,000 feet. 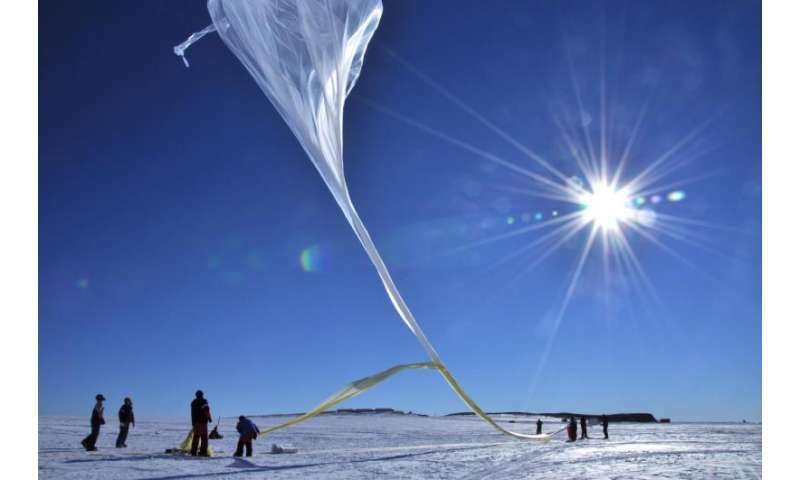 Supported by NASA, the project is called BARREL, an acronym for Balloon Array for Radiation belt Relativistic Electron Losses. The instruments record the X-rays produced as the falling electrons collide with the atmosphere. "Earth's magnetic field looks like that of a bar magnet," Millan says. "If you follow from the equatorial plane down to the poles, particles move along those magnetic field lines. That's why we see the aurora in the northern and southern hemispheres." The second source of information, also a NASA project, comprises the two Van Allen Probe satellites launched in 2012. The probes circle the Earth in eccentric orbits around the equator at altitudes of up to 20,000 miles. Flying in nearly identical eccentric orbits circling the Earth every nine hours, they cover the entire radiation belt region. The Van Allen radiation belts exist as two separate rings, with an outer one orbiting at a distance of some 8,000 to 40,000 miles, and an inner band at about 600 to 3,700 miles. "Our paper looked at plasma waves," says Millan. "These are like sound waves in air except that now you are in an ionized gas so the electric and magnetic fields are affected." Millan describes a solar flare that occurred in January 2014, releasing a burst of solar wind particles that hit and disturbed Earth's magnetic field. That created a particular kind of wave called "plasmaspheric hiss," examples of which have been observed for decades in the dense plasma region that encircles the Earth in the upper reaches of the atmosphere. "What the paper shows is that we observed these waves at the location of the Van Allen probes. We saw electric and magnetic field variations that displayed a pattern, matching the variations in the X-rays we were recording in Antarctica," Millan says. "We concluded that those waves were causing the electrons to be scattered, yielding a new understanding of how the particles are getting kicked into the atmosphere. We are learning about processes that can affect our lives directly, when active in our planetary environment. These same processes are probably happening throughout the universe and, with the tools at our disposal, we can study them in detail right here." Their findings appear in the journal Nature. We are learning about processes that can affect our lives directly, when active in our planetary environment. This research is explaining the 'how' of x-ray interaction with the Earth's atmosphere, which is good considering the 'why' is going to go to sleep soon.